9 Star Ki is a popular system of astrology, often used alongside Feng shui. It is an adjustment or consolidation, made in 1924 by Shinjiro Sonoda, to traditional Chinese divination and geomancy methods, such as Flying Star Feng Shui, the Ming Gua number from the Eight Mansions Compass School of Feng Shui, and combining the Lo Shu Square with the Later Heaven, Bagua. Nine Star Ki is a way of looking closely at patterns of yin and yang energy in our environment over time and understanding how these energy movements affect each of us. Nine Star Ki is a tool to becoming aware of our energetic tendencies, understanding our patterns of behaviour, and managing our future and destiny. Origin of astrology Nine Star Ki is unknown. Evidences exist, that people were using it already 8500 years before our counting. There have even been many indications that Nine Star Ki Astrology existed in Tibet and in India. Of course, name of it is different as names were changed in history. In modern times Nine Star Ki was used in China, then simplified in Japan and renamed to Kyu Sei Kigaku. As late as in 1970 it was ported to western world and now is used all over the world. On west we are used to call it Nine Star Ki. There are thought to be nine-year and nine-month cycles of Ki/Qi on Earth, which are related to solar and seasonal cycles, and which have common effects across the planet on people's mental and physical development and experiences throughout their lives. The 9 Star Ki stars are numbers that represent those cycles. The numbers can be calculated for anyone on/from Earth using only a birthday. The system most commonly uses two numbers. First, the Honmei star 本命星, true feelings star, like Honmei choco, is the principal, adulthood, or year number, describing one's most mature mind/heart, karma, or spirit type. 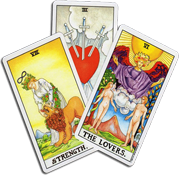 Your Primary number represents the energy that you have by nature, that is, yourself; reflects your constitutional or basic character and personality. This number is for general use in determining the primary character, overall life direction, and constitution of a person. Your primary number can be determined by using the following steps. Take the last two digits of your year of birth, and add them together. If the sum is 10 or greater, then add these two new numbers together to come to a single digit. Subtract this digit from ten. The difference is your Primary Number. The Nine Star Ki year begins around February 4th or 5th, the point between the Winter Solstice and the Spring Equinox. People born before this date have a Primary Number of the year before. Second, the Getsumei star 月命星, month life star, is the character, childhood, or month number, describing one's physical connection to the Earth, namely one's more primitive or physical features. Your secondary number representing your inborn energy, that is, your behaviour. Your secondary number can be determined by using the following table. These two stars influence each other to form your personality. Generally speaking, you are affected 60-70% by your Honmei Star and 30-40% by your Getsumei Star. Until your early 20s, especially, you are strongly under the influence of superficial characters indicated by the Getsumei Star. And as you mature mentally, you will be influenced strongly by the Honmei Star. Everyone is under the influence of both the Honmei Star and the Getsumei Star. And the ratio between the two differs from person to person. A third, energetic number is given by some sources and calculators, especially in the Western world, and is said to describe one's outward behaviour, personality, or the first impression one usually makes on others. Being derived from the principal and character numbers, the energetic number may not provide new information. It is not a day-specific number, which one can determine by other means. 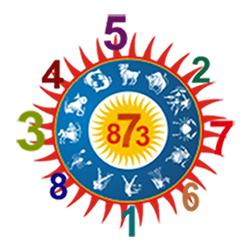 The energetic number also differs from the Ming Gua number used by the Chinese Eight Mansions Compass School of Feng Shui. The numbers are each associated with one of the Chinese Five Elements, following the Later Heaven, Bagua pattern. Each number/star is considered a variation on the characteristics of that Element group. For example, 3 is the blue-green Wood star, whereas 4 is the dark-green Wood star. Combining the Lo Shu Square with the Later Heaven Bagua, blue-green is meant to indicate being more excited, aroused, and early Spring-like, whereas dark-green means being more gentle, flexible, and later Spring-like. Number 1 stands alone as Water; 2, 5, and 8 are the Earth group; 3 and 4 are the Wood group; 6 and 7 are the Metal group; and 9 stands alone as Fire. 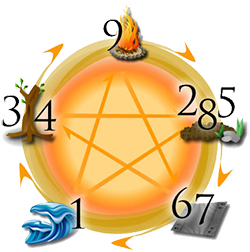 The Taoist theory of the five elements, Wood, Fire, Earth, Metal and Water is a way to define Chi (energy). The elements, like Yin and Yang, have a cyclical harmony and balance which permeates through all things. Understanding our own elements through, 9 star ki, can help us create balance and health in our lives. When we are in balance we work the qualities of our elements towards the greater good. When we are out of balance we can become angry, anxious, nervous, fearful or stuck. With the understanding of the elements and how they work together we can make simple shifts that will bring things back to a balanced, productive state. One: Kan, water. There are two types of water chi: Still and moving. Still waters run deep. This type is shy, secretive. Moods run from one extreme to the next. Knows a little about a lot. Ones are complainers and they don't like to follow chain of command. They have trouble finishing things. Moving waters like to stir things up. They are strong & very independent. They love travel. Be careful not to isolate yourself too much, for One is the loneliest number. Two: Kun, earth. Represents Mother on trigram. Nourishing, tactful, sincere & loyal. Always finding short-cuts to complete their work. They are motherly & conservative. Women tend to treat their boyfriends like babies. A 2 person is reserved & gentle. They tend to build their lives slowly, but surely. Three: Chen, wood; spring. They have tremendous energy and a youthful demeanour. May have younger mates. They love to try new things first, but they get bored easily and move on quickly. Trendsetters. Quick tempers. Usually good with money, but can be a spendthrift. Their bluntness can get them in trouble. Stay away from drugsand alcohol, can become addictive & behave badly. Good occupations are entertainers; fashion models; healers & teachers (especially with children). Four: Hsun, mature wood. Practical; stubborn; vulnerable in love. Their personality is like the Wind, hard to grasp and forever changing directions. Indecisiveness makes them miss many opportunities. They are resistant to change. Sensitive; good listeners. Charismatic auras. They make good musicians, artists and counsellors. Five: Tai Chi; earth. Power & leadership. They are the Centre, the Soul of an organization. The men can be womanisers. And, the women can spoil their man. They're usually surrounded by many dependent people. But, they love to take people under their wings. Very practical skills. Usually receives help from strangers. They make good politicians; judges; army officers. Six: Chyan; metal. Very efficient and on time. People are usually afraid of them, so they have difficulties in relationships. Sharp-tongued and strong-willed. Hard worker, but be careful not to rush. In the beginning, they are your benefactor, then later, you become their slave. Good careers for a Six would be a lawyer, psychologist or in real estate. Seven: Dui; unrefined metal. Charming, sociable and they really enjoy life. A smooth talker. However, they'll do what ever it takes to get what they want even if it includes losing their dignity. Like a child, they don't like to share. They are bad housekeepers. And, they love luxury. Eight: Ken; earth. Intelligent; well-groomed; loves courtship & to be woo. Eights are born with perfect, shapely figures. Very demanding of others. Very dramatic luck. A joke teller. And, a very nice person. They make good comedians, scientists, lawyers and editors. Nine: Li; fire. A Super auspicious number. Nines are well-known and kindly. Very aware of their appearance and always competing for the spotlight. Nines are very proud. They have an air of superiority around them. Impulsive behaviour can make them inconsiderate to others. Nines are show business people; other careers would include fashion designer; fashion models; and politicians. What is your 9 Star Ki Number? 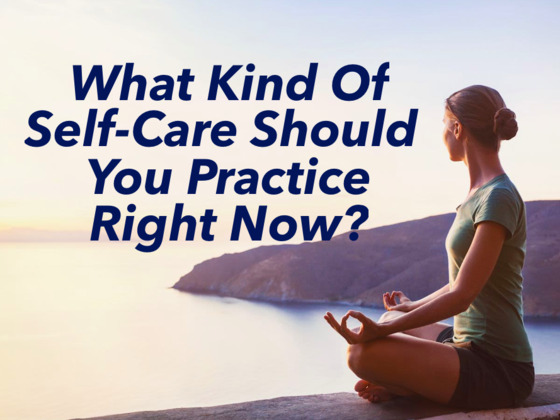 What Kind of Self-Care Should You Practice Right Now?